Cunningham Bounds Brings 100m Claim Vs Southern Co Mississippi Power » Mr. Dunn Goes to Montgomery | Who's Behind the Mask? Portion of lawsuit by Treetop Midstream Services vs. Mississippi Power and Southern Co.
Author’s Note: About two weeks ago, someone called me to ask about matters I’d written about on this web-site. I was told that a lawsuit related to Mississippi Power’s Kemper project was likely to be filed in the coming weeks. I did not learn the identity of the plaintiffs, or the nature of the claim, until reading the lawsuit Friday. I make this note because I am from Mobile, as is the lead law firm in this case, and out of concern that someone might see a connection where there is not. The lawsuit is at the bottom of this post. Should anyone wish to suggest a correction, or provide me with additional information, you can reach me on my cell, at 251-454-1911; or by e-mail, at eddcurran@aol.com. My “circulation department” is mass e-mail. If you think you know someone who will be interested in this story or website, by all means share. Officials with Mississippi Power and Southern Co. directed Treetop Midstream Services LLC to proceed with building a CO2 pipeline despite knowing there would be significant delays in completing the Kemper “clean coal” plant and generating the CO2 that Midstream had contracted to purchase from the plant, according to a lawsuit filed Thursday. Ridgeland, Miss.-based Treetop and associated companies contend that they never would have begun much less spent tens of millions of dollars on the pipeline had Mississippi Power and Southern Co., been truthful about the timeline for completion of the plant. According to the complaint, Mississippi Power terminated its CO2 sales contract with Treetop on June 3. 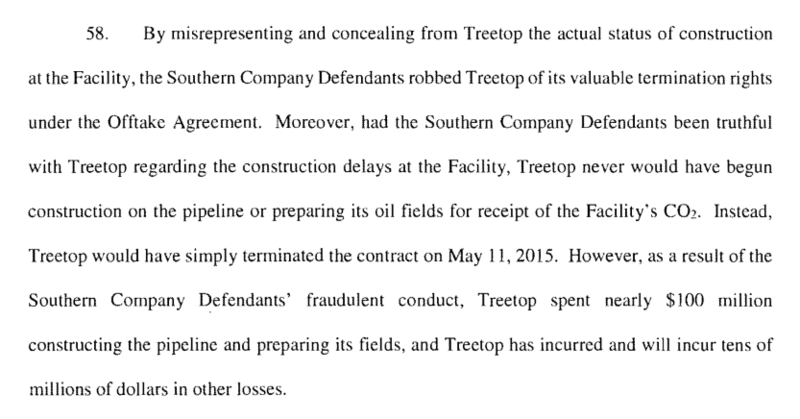 “Thus, after intentionally misrepresenting and concealing the Start Date for the Facility and forcing Treetop to unnecessarily spend nearly $100 million on a pipeline and other equipment, the Southern Company Defendants have now left Treetop with a pipeline to nowhere that never would have been built but for the fraudulent conduct of the Southern Company Defendants,” the plaintiffs contend. Tellus Operating Group LLC, of Ridgeland, Miss., is the parent company of Treetop, and a co-plaintiff in the lawsuit. Treetop and connected companies filed the case in Gwinnett County (Ga.) Circuit Court, in the Atlanta area. Defendants are Mississippi Power, Southern Co., and Southern Company Services. The lead attorneys are from the well-known Mobile-based plaintiffs firm, Cunningham Bounds. The plaintiffs seek to recover $100 million they say they have spent to date; tens of millions of dollars in anticipated future losses related to the pipeline, and punitive damages. In many ways, the lawsuit dovetails with the generalized claim that Mississippi Power and its parent, Southern Co., have long known that the now $6 billion-plus plant would not be completed according to long-held timelines; and that, for financial reasons, the defendants intentionally concealed the nature and severity of the delays. In May, Southern Co., disclosed in its quarterly report that the Securities and Exchange Commission is “conducting a formal investigation” into accounting and disclosure issues regarding Kemper. Here is that statement. I am not qualified to assess the gravity of such a disclosure to the SEC by Southern Co. and Mississippi Power, such as regarding the frequency of such disclosures by public companies; or the likelihood, after such disclosures, that some punitive finding is issued. Clearly, though, the plaintiffs in this case are basing their allegations on some of the issues the SEC is reviewing. Mississippi Power’s Kemper plant is producing power with purchased natural gas, but has yet to operate as intended — on a natural gas like product produced from coal. Needless to say, the lawsuit presents Treetop’s version of events. The defendants assuredly will present a far different version. To understand the lawsuit, one needs to have a basic understanding of the Kemper plant and the CO2 component of it. In simple terms, the Kemper plant will burn coal at extremely high temperatures to turn it into a natural gas like substance. That gas will then fuel the power plant, and create electricity. The purpose is to make use of abundant coal but in a way that does not generate the high level of pollutants created by coal-fired power plants. The plant is being designed to “capture” at least 65 percent of the CO2 generated during the coal gasification process. For numerous reasons, both building and operating the plant was always going to be far more expensive than a normal coal-fired power plant. However, the sale of the captured CO2 was touted from the start as being one of the financial engines that would help the company overcome these expenses and make the plant viable. 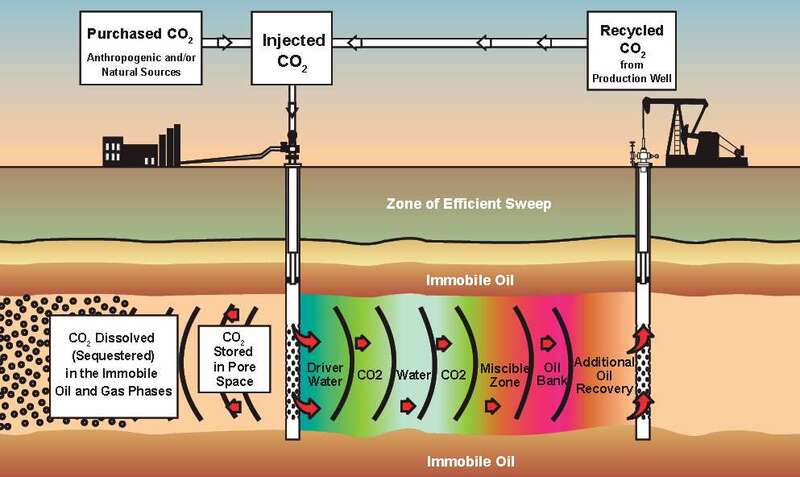 The CO2 purchasers pump the odorless, colorless gas into old, otherwise dormant oil fields to force hard to reach oil to the surface. Below, a graphic (which I found on the Internet) that illustrates the use of CO2 by companies like Treetop. The success of such techniques, including fracking, led to an oil and gas boom that was in full swing in May 2011, when Mississippi Power contracted with two such companies to buy the Kemper-generated CO2. The largest CO2 contract was with Texas-based Denbury Resources, which committed to purchase 70 percent of the CO2 generated at Kemper. As part of that deal, Mississippi Power agreed to build, and pay for, a pipeline to deliver the product to Denbury. That pipeline is complete, or very close to it, at a total cost of just above $100 million. This photo shows a CO2 pipeline being built. I believe it’s the Kemper pipeline. 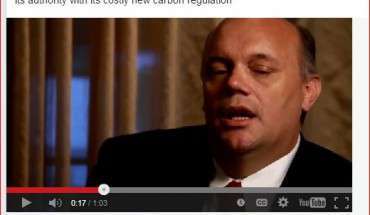 The second contract was with Treetop, which agreed to buy 30 percent of the CO2. According to the lawsuit, Treetop’s agreement required it to build, and pay for, it’s own pipeline. There were no exhibits attached to the lawsuits, such as the contract between Mississippi Power and Treetop. It’s unclear from the lawsuit if Mississippi Power in some fashion pledged to reimburse Treetop for the costs of building the pipeline if the plant failed to go into operation and produce CO2, though it appears not. Obviously, the pipeline would have to be built, and completed, before Kemper began generating the CO2. Treetop asserts that the clause allowing it to withdraw from the agreement if Kemper wasn’t producing CO2 by May 2015 served as the safeguard to prevent it from building the pipeline and investing — no doubt through borrowing — the necessary funds. According to the lawsuit, Treetop negotiated “several timing parameters” into its contract with Mississippi Power. Treetop cites meetings in which it states that it was told by Mississippi Power that the plant would be operational and producing CO2 by May 2014. As a result of those statements, Treetop began spending tens of millions of dollars to build the pipeline, according to the lawsuit. Though the lawsuit does not break down the $100 million in expenditures Treetop claims to have made, it does state that some portion of that $100 million was spent preparing oil fields for when the CO2 would be available. The lawsuit presents evidence which Treetop contends shows that Mississippi Power knew that the plant would not be in operation by May 2014. Warnings by company employees that the May 2014 could not be met. The lawsuit only identifies one such employee. He is Brett Wingo, a construction manager at the site. (For stories on this website about Wingo and his situation, go Here and Here.) Wingo has asserted that he personally called Southern Co. CEO Tom Fanning to warn him that the company was not being truthful on its SEC filings regarding the projected completion of Kemper. The lawsuit mimics prior allegations against Southern Co., such as some cited by Wingo, in stating that one reason Southern Co. sought to conceal the delays was that it would lose some $1 billion in tax credits/incentives related to the clean coal aspect of the project if it did not meet the timeline. Other declared motives involve the defendants efforts to increase rates to Mississippi Power based on the costs of building Kemper, but prior to the customers receiving the benefits of the plant. One question that seems fair to ask: Why, if Mississippi Power/Southern Co. knew they could not deliver the CO2 by May 2014, would they not admit so in private meetings with Treetop, and thus spare Treetop from spending such substantial sums to build a pipeline? If Mississippi Power/Southern Co. told Treetop that Kemper wouldn’t be operational and generating CO2 by May 2014, they would be contradicting what they were telling the rest of the world, most importantly, the investment community through the companies’ public filings with the SEC. This is a very public project, covered routinely by the Mississippi media and national business press. It’s not as if the folks at Treetop weren’t keeping abreast of the news and likely the SEC filings as well. It’s hard to see how Southern Co. could tell Treetop one thing and the SEC the other. One could argue that it would be impossible for them to do so. If this speculated scenario is accurate — and it very well may not be — then the defendants would have essentially been throwing Treetop into the gutter solely to protect the bogus timeline they were foisting on the public, and the SEC. On the Kemper hot-seat: Southern Co. CEO Tom Fanning. If that could be proved, such as in discovery, one would think that the defendants might have a real problem on their hands. 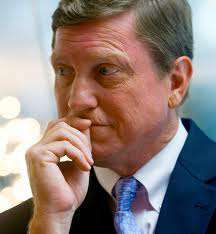 That the law firm bringing the case is Cunningham Bounds makes that potential picture even more concerning. As the legal community in Alabama and beyond well knows, lawsuits with that firm’s name on them are good cause for increased blood pressure readings in defendants. A defense one can image being offered by Southern Co., is that it, too, paid for and built a pipeline — the one for Denbury. Then again, it had to build it at some point; and failing to do so — as necessary, well in advance of May 2014 — would have been one and the same as publicly declaring that the plant could not be completed by the publicly projected date. Needless to say, my speculation is based on the assumption that top officials at Mississippi Power and Southern Co. knew with a high degree of certainty that the publicly touted timeline was unrealistic and could not be met. One has to assume that there are a host of people within the company who will testify to believing the timeline was accurate, and that top officials at Southern Co. and Mississippi Power believed Kemper would be operational by May 2014. The strongest argument against the company on this point is that it’s now more than two years past the May 2014 completion date, and Kemper still isn’t producing power with gasified coal, and, as part of the process, selling CO2. Lastly, a note on the venue. As in, why would Mississippi-based plaintiffs with a Mobile law firm file their lawsuit in Gwinnett County Circuit Court? I don’t have the answer, but there has to be some reason. As the lawsuit makes clear, there would seem to have been many choices. Unidentified owners and/or investors in at least one of the plaintiff companies include people or companies from Alabama and Mississippi as well as Georgia, though, clearly, most of the plaintiffs, including Treetop, are based in Mississippi. Southern Co. is based in Atlanta, in Fulton County — not Gwinnett County. Co-defendant Southern Company Services is based in Birmingham, and, of course, Mississippi Power, like Treetop, is based in Mississippi. It seems like the plaintiffs could have filed this lawsuit in federal court in either of those three states, or, if in state court, in any one of a host of counties in either of the three states. The lawsuit states that Southern Co., is a Delaware company, and maintains an agent of service for process in Gwinnett County. That’s the cited basis for filing it there, as best as I can tell. It seems fair to suggest that if there’s a reason the plaintiffs want to litigate it in Gwinnett County Circuit Court, then the defendants won’t want to. Thus, one of the early battles may involve efforts by the defense to move the case to another jurisdiction. This website, and all the work it entails, and it’s a lot, is brought to you by Curran Research and Writing Services. If you or your company need in-depth research, please consider me. For me to continue the type reporting found on this web-site, I must receive donations. My wife has taken to calling this my “Jesus Project” — because I’m doing it without pay, and thus, for charity. To make donations, large, medium-sized, or small, Go Here. You can also send checks to the address below. People with tips on this story or regarding other subjects addressed on this website are encouraged to contact me. Do the same if you believe you or your company can benefit from the sort of research on display here.